Snow days, if not spent panic-buying milk, harnessing your neighbour's St Bernard to a sleigh or sliding down a hill on a bin bag, are probably best spent erecting figures - whether they be the traditional carrot-nosed snowman or a more ambitious attempt to sculpt the cast of Game of Thrones chilling out at the Taj Mahal. Although for most of us, numb icy fingers and wet mittens tend to lead to the abandonment of such projects in favour of a hot drink and a nice sit-down, some determined and hardy souls persevere with their creations. And so we present some of the best snow sculptures from around England. The Tynemouth Lodge Hotel in North Shields has a new (cool) customer. Propped up outside the bar is a bobble-hatted man in white. Member of staff Vette Normanly says: "We made the most of our snow day yesterday, building a new visitor." Not content with just the one snowman, Chris Newson, a former rough-sleeper and now an artist and picture-framer, made four. The figures outside his shop in Leiston, Suffolk, are intended to highlight the plight of homeless people having to face the freezing weather. This splendidly-spined snowbeast - a dinosaur or maybe a dragon - was made by the Tink family in Norwich. Bailey, a pupil at The FitzWimarc School in Essex, made this brilliantly bloody Jaws. 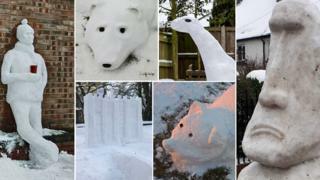 Mark Wright from Stockton-on-Tees chiselled the handsome chap above, saying "it's so cold even the polar bears are out", while Laura Hale, from Colchester, created the woodland creatures below. As these pictures demonstrate, snow is also excellent (in the right hands) for moulding buildings and structures. Emma Swarbrick channelled Isambard Kingdom Brunel and produced the Clifton suspension bridge, while a team - yes a team - of architects made a scale model of Norwich Castle. And while we're talking about buildings, here's an igloo that was made in West Mersea in Essex. It took six people, one dog, and multiple cans of beer five hours to make. You can see the whole process (sped up) here. Chandler from Norwich is the creator of this tribute to Denis the French bulldog. Both Denis and this Easter Island head in Shifnal, Shropshire, have a similar expression: Unimpressed. And we finish with a picture of this avant-garde sculpture shared by Sara Bourner who says she's "not sure if 'snowman' accurately describes what my children have created". We're sure she must be very proud.